Does vitamin D deficiency lead to insulin resistance in obese individuals? Aim: Obesity has become an important health problem in developed and developing countries. Nowadays, vitamin D deficiency is very common in obese individuals. Vitamin D deficiency and obesity are associated with cardiovascular disease, metabolic syndrome, type 2 diabetes, and other diseases. In our study, we aimed to investigate the effect of vitamin D deficiency on insulin resistance in obese subjects. Materials and Methods: A total of 170 individuals, (146 females and 24 males) were included in the study. According to Body Mass Index (BMI), patients were divided into 3 groups. Serum vitamin D was compared with insulin resistance and HbA1c. Results: It was shown that serum vitamin D levels were statistically decreased according to BMI. There was also a statistically significant increase in Hba1c level due to increased BMI. There is also a positive correlation between BMI and insulin resistance. Positive correlation was found between HbA1C and insulin resistance. There was no statistically significant difference between the levels of insulin resistance among the groups of BMI. Conclusions: In conclusion, Vitamin D deficiency can be seen in obese individuals. Low serum vitamin D levels may accelerate the development of diabetes in obese individuals. Serum vitamin D levels should be measured in obese individuals and necessary treatment should be performed. This may be helpful in obesity treatment and prevention of diabetes development. Obesity has become an important health problem in developed and developing countries . Chronic binge eating is the most important cause of obesity. However, genetic susceptibility, sedentary lifestyle, and excessive fat storage in the body can also cause obesity. In developed countries, 40% of the population is overweight while 20% of the population is obese. In some countries, 3/4 of the adult population is overweight. In developed countries, this rapid increase in obesity without unchanged genetic background is caused by excessive energy intake and reduced physical activity. Continuous excessive energy intake leads to hypertrophy of adipocytes due to excessive triglyceride storage. In the liver and muscle tissues, impairment of insulin secretion occurs due to the interaction with the insulin signaling cascade and increased apoptosis of pancreatic beta cells, and insulin resistance is induced . Nowadays, vitamin D deficiency is very common in obese individuals. Vitamin D deficiency and obesity are associated with cardiovascular diseases, metabolic syndrome, type 2 diabetes, and other diseases. 25-hydroxy vitamin D concentrations are considered to be the best indicators of total body vitamin D deposits. It is known that there is a relationship between decreased vitamin D concentrations in circulation and obesity. However, the mechanisms have not yet been clarified. The role of vitamin D supplements in the treatment of obesity is still unknown. Vitamin D deficiency is thought to be associated with the presence of cardio metabolic risk in obese individuals . Different limit values have been suggested for vitamin D evaluation. If the level is 20 ng/ml or below it refers to the “deficiency”, if the level is 21-29 ng/ml it refers to the “insufficiency”, and if the level is more than 30 ng/ml it refers to the “sufficiency”. An intoxication of vitamin D may occur when the 25-OH VitD level exceeds 150 ng/mL . We have planned this study in order to show the effect of changes in Vitamin D levels on obesity and insulin resistance. Amasya University Sabuncuoğlu Şerefeddin Training and Research Hospital database was used and we worked with 170 people (146 women and 24 men) who were enrolled in the clinics between January 1, 2016 and December 31, 2016 and who were treated and followed by dieticians. The patient’s data were examined and they were divided into 3 groups according to Body Mass Index (BMI) values. Serum vitamin D was compared with the insulin resistance and HbA1c. Liver enzymes, blood creatinine, and fasting glucose levels of patients were normal. Exclusion criteria were determined and patients with diabetes, metabolic disease, and deterioration of the liver and kidney function were excluded from the study. The insulin resistance was calculated as follows: HOMA index (fasting insulin (pmol/L) × fasting plasma glucose (mg/dL)/ 405). BMI was calculated by using the body weight (kg)/ squared body length (m) formula. Serum vitamin D measurements (normal values: 20-100 ng/ml) were performed on a Siemens Advia Centaur xp instrument by using an electrochemiluminescence technique. Similarly, serum insulin measurements (normal values: 2.6-37.6 pmol/L) were also performed on a Siemens Advia Centaur xp instrument by using an electrochemiluminescence technique. Serum glucose measurements (normal values: 74-109 mg/dl) were performed on the Olimpus AU 5800 by using the glucose oxidase method. HbA1c measurements (normal values: 4-6%) were performed on the Trinity/Menarini Premier device by using HPLC boranat method. GraphPad Prism version 6.00 was used for statistical analysis (GraphPad Software, La Jolla, California, USA). One-way ANOVA was used to compare quantitative data. Multiple logistic regression analyses were performed to investigate how dependent variables were affected by independent variables. The chi-square test was used to understand gender differences. The results were evaluated in 95% confidence interval and with the p<0.01 significance level. Correlation between the parameters was determined by using Pearson correlation analysis. Correlation coefficient (r) was evaluated as weak when it is between 0.00-0.24, moderate when it is between 0.25-0.49, when it is strong between 0.50-0.74, very strong when it is between 0.75-1.00. A total of 170 people were included in the study. According to body mass indexes, vitamin D levels of 47 patients (27.6%) were <25. 97 of them (57.1%) had vitamin D levels between 25-35 and 26 of them (15.3%) had vitamin D levels>35. Of all patients with <25 vitamin D levels, 12 of them (25.5%) were male and 35 of them (74.5%) were female. Of all patients with vitamin D levels between 25-35, 8 of them (8.2%) were male and 89 of them (91.8%) were female. Of all patients with vitamin D levels>35, 4 of them (15.4%) were male and 22 of them (84.6%) were female (Figures 1 and 2). 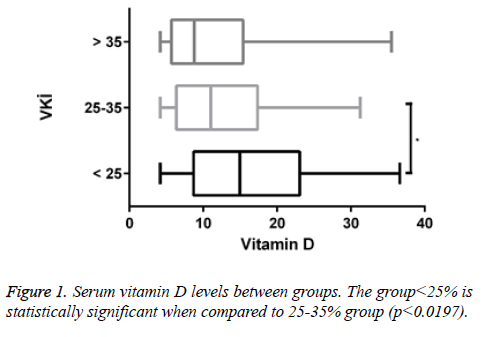 Figure 1: Serum vitamin D levels between groups. The group<25% is statistically significant when compared to 25-35% group (p<0.0197). 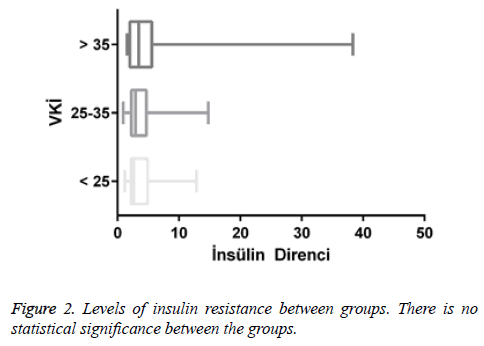 Figure 2: Levels of insulin resistance between groups. There is no statistical significance between the groups. Table 1 shows gender differences according to the body mass indexes. No statistically significant difference was observed in terms of genders. Table 1. Gender difference according to the body mass index. There is a positive correlation between BMI and vitamin D at an unacceptable level (r=0.029, p<0.699). There is a positive correlation between BMI and insulin resistance too (r=0.105, p<0.168). There is a positive correlation observed between BMI and HbA1c (r=0.183, p<0.0166). There was a negligible negative correlation between vitamin D and insulin resistance (r=-0.046, p<0.547). 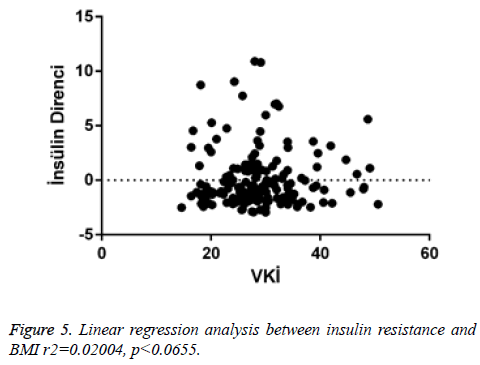 Positive correlation was found between HbA1c and insulin resistance (r=0.082, p<0.286). There was a very low positive correlation between insulin resistance and HbA1c (r=0.007, p<0.926) (Figure 3) (Tables 2 and 3). Figure 3: Levels of HbA1c between the groups. The group<25 and group>35 were statistically significant (****p<0.0001), and group 25-35 and group>35 were statistically significant (**p<0.0051). Table 3. Some statistical values of the groups. When linear regression analysis was performed, 5.8% of the high vitamin D level was attributed to an increase in the body mass index (r2=0.05878) (Figure 4). Again, when linear regression analysis was performed, 2% of the very low increase in insulin resistance is attributed to an increase in body mass index (r2=0.02004) (Figure 5). When linear regression analysis was performed, 8% of the very low increase in insulin resistance is attributed to an increase in body mass index (r2=0.08848) (Figure 6). 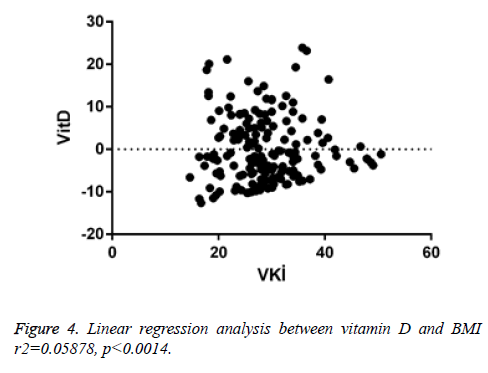 Figure 4: Linear regression analysis between vitamin D and BMI r2=0.05878, p<0.0014. Figure 5: Linear regression analysis between insulin resistance and BMI r2=0.02004, p<0.0655. Figure 6: Linear regression analysis between HbA1C and BMI r2=0.08848, p<0.0001. Industrialization and urbanization have caused significant changes that can lead to obesity in people’s lifestyles. The abundance, cheapness, and easy accessibility of food ingredients cause excessive calorie intake. On the other hand, the decrease in physical activity results in less energy expenditure . Obesity is a chronic condition that causes particularly insulin resistance and type 2 diabetes, and liver fat, atherosclerosis, dementia, respiratory diseases, and some types of cancer. Throughout the world, obesity is considered as a reason for the increased frequency of the type 2 diabetes. Approximately 70% of type 2 diabetic patients are obese. Compared to normal people, the rate of the disease is 5 times higher in obese men and 8.3 times more in women . Various experimental and clinical studies have shown that vitamin D has well-known effects on calcium homeostasis and bone metabolism. Besides, vitamin D has many important functions. Numerous evidences suggest that vitamin D deficiency is a risk factor for various diseases. Decreased levels of vitamin D may cause insulin resistance and impaired insulin secretion . Vitamin D reduces the insulin resistance in the surrounding tissues and thus reduces the excessive insulin release in response to increased blood sugar due to insulin resistance. As a result, it increases the insulin sensitivity. Therefore, vitamin D deficiency is a risk factor for metabolic syndrome and a type 2 DM. D vitamin insufficiency is also associated with insulin resistance and β-cell dysfunction. Vitamin D does not only increase the production capacity of β-cells, it also accelerates the pro-insulin conversion . Insulin resistance is biologically impaired in response to exogenous or endogenous insulin. Biological responses to insulin in vivo vary depending on the insulin concentration, the rate of insulin release, and the duration of vitamin D in circulation. The insulin is released from the pancreatic beta cell so that it can exert its biological effect. Vitamin D participates in the systemic circulation via portal tract and it binds to receptors on the cell surface. Then, the insulin enters the cell and initiates the post-receptor process. A disruption that can occur in one or several of these steps results in the abnormal response of the organism against insulin. Thus, insulin resistance is a complex cellular disorder that affects many organ systems and leads to severe metabolic defects . Fat cells are endocrinologically active cells and contain the vitamin D receptor (DVR). Therefore, fat tissue is among the target tissues for active vitamin D. Vitamin D causes inhibition of adipogenesis . Meta-analyses also confirm the results in the same way. In non-obese diabetic rats, the administration of high dose 1, 25- hydroxy-vitamin D inhibits the onset of diabetes by immunomodulation. This effect is related to the effects of inflammatory cytokines (IL-6 and TNF-alpha) on the beta-cell function. The application of this cytokine leads to hyperglycemia. Chronic administration of 1, 25-hydroxy vitamin D at pharmacological doses reduces the incidence of diabetes in non-obese diabetic rats . Studies have shown that active vitamin D and its analogs inhibit in vivo IL-12 and Th-1 dominance. Again, CD4/CD25 and FoxP3 increase regulatory T cell numbers and thus they can be useful for the diabetes control. It has been reported that Ro-262198, a vitamin D analogue, is effective in the control of type 1 diabetes in adult Non-Obese Diabetic (NOD) mice and improves the course of the disease (100-fold strong immunosuppressive activity and non-hypercalcemic effect from vitamin D). These effects are due to IL-12 suppression, inhibition of infiltration of the pancreas with Th-1 cells, increased T regulatory (Treg cells) cells in the pancreatic lymph nodes, and suppression of immunological process, and thus delaying of the clinical onset of type 1 diabetes in NOD mice. In this process, CD4/CD25 Treg cells were found to be more important than Th2 differentiation. Also, due to the proapoptotic effects of active vitamin D or its analogs, it leads to the delay of the onset of diabetes by providing immunological tolerance through dendritic cells and T cells. It has been shown that the development of type 1 diabetes slows down in prediabetic adult NOD mice administered short-acting active vitamin D or its analogue . Insulin secretion in rats with vitamin D deficiency showed a reduction of 48% when compared with rats receiving supportive treatment in the same group . After supportive care in rats with vitamin D deficiency, glucose tolerance and insulin secretion improve independently of nutritional factors, plasma calcium, and phosphorus concentrations . In the development of type 2 diabetes, vitamin D and calcium have been reported to be effective at varying rates in the development of these processes. The effect of vitamin D on healing of beta cell function can be directly or indirectly influenced. One of the most important proofs of direct effect is the expression of the DVR gene and 1-alpha hydroxylase gene in beta cells. Vitamin D has been reported to increase insulin secretion in response to glucose stimulation but not basal insulinemia. Disruption in response to insulin secretion has been shown in DVR knock-out mice. Human insulin promoter gene contains DVR, with the effect of active vitamin D human insulin gene gain transcriptional activity. In case of missing DVR insulin secretion which is induced by glucose is inhibited. Improvement of the insulin secretion due to the vitamin D supplementation is considered to be a direct effect of vitamin D on the improvement of beta-cell function . In insulin resistance, and type 2 diabetes, vitamin D is thought to be involved in impaired pancreatic beta-cell function with various mechanisms . The relationship between hypovitaminosis D and insulin resistance was assessed in diabetic and normal subjects. Type 2 diabetes or glucose intolerance occurs as a result of insulin sensitivity or pancreatic beta cell defects. Indirect insulin resistance was calculated and compared to serum vitamin D levels. Fasting insulin, fasting glucose, and indirect insulin resistance index values were significantly lower in diabetic patients without insulin resistance compared to diabetic patients with insulin resistance. At the same time, fasting insulin and indirect insulin resistance index levels were significantly lower when the control group without insulin resistance and control group with insulin resistance were compared to each other . Studies have shown that elevated serum vitamin D concentration reduces insulin resistance and type 2 diabetes risk . Another study has shown a positive correlation between insulin sensitivity and vitamin D concentration. Vitamin D deficiency has a negative effect on beta cell function. People with hypovitaminosis D are thought to be at risk for insulin resistance and the metabolic syndrome . In another study, there was no increased association between vitamin D deficiency and obesity in type 2 diabetes or insulin resistance. However, although it is not statistically significant, there was a strong association between abnormal obesity and vitamin D deficiency in the case of insulin resistance. In addition, a 47% increase in insulin resistance can be explained by the relationship between high BMI and vitamin D deficiency . Differences in insulin sensitivity and metabolic parameters were examined according to vitamin D levels in pre-diabetic elderly. There was a statistically significant negative correlation between plasma vitamin D levels and HOMA-IR and insulin levels in all cases. Insulin sensitivity is thought to be reduced in pre-diabetic elderly patients with vitamin D deficiency . Despite its overstorage in body fat compartments, obesity synergistically interacts with vitamin D because of its reduced bioavailability. Insulin resistance and increased risk for type 2 diabetes are considered . In another study, the relationship between insulin sensitivity and serum vitamin D concentration was examined, and insulin sensitivity was found to be better in normal subjects than in overweight subjects . Vitamin D is thought to reduce insulin resistance which is induced by free fatty acids in muscle cells . It was observed that there was a relationship between insulin sensitivity and vitamin D. In NHANES III study, it was reported that the incidence of metabolic syndrome due to possible insulin resistance in males and females with low vitamin D levels may increase and it can be caused by abnormal obesity . In non-diabetic patients, initial vitamin D levels have been shown to be inversely proportional to glucose levels, insulin resistance, and risk of a 10 y metabolic syndrome independent of risk factors . Vitamin D deficiency/insufficiency was found in 115 patients with pre-diabetes. Severe vitamin D deficiency (<10 ng/ml) was seen in 14.65% of the individuals. Individuals with the lowest vitamin D levels were also the ones with the highest insulin resistance levels (HOMA2-IR: 2.04 ± 0.67). There was a statistically significant inverse correlation between serum vitamin D and insulin resistance. There was a positive correlation with insulin sensitivity. There was no correlation between vitamin D levels and estimated beta cells. The mean waist/height ratio was 0.57 (normal<0.5) among the prediabetic subjects. It shows the high cardiovascular morbidity. High insulin resistance and 1 h PG values were significantly correlated with 2 h blood glucose in individuals with high 1 h blood glucose ((1 h PG)>155 mg/dl). As a result, vitamin D deficiency or insufficiency may play a role in the development or worsening of insulin resistance in pre-diabetic individuals with high cardiovascular risk . Vitamin D deficiency in obese adolescents can cause adverse effects on insulin resistance and glucose homeostasis. Vitamin D deficiency is associated with the risk of obesity, type 2 diabetes, and metabolic syndrome. The biological mechanisms of vitamin D in obesity and glycemic control have not yet been not well understood. It is thought vitamin D insufficiency leads disorder of insulin secretion, hepatic/periferic glucose intake, and inflammation. Most of the studies conducted to date show a significant relationship between circulating vitamin D concentrations and insulin sensitivity/resistance indices. In some clinical trials in which patients received vitamin D treatment, beneficial effects of vitamin D on insulin resistance and impaired glucose tolerance were observed in obese adolescents . Serum vitamin D deficiency is defined for <20 ng/ml level. Serum vitamin D levels were significantly lower in overweight/obese adults with metabolic syndrome compared to healthy individuals. Vitamin D deficiency in overweight and obese individuals is more frequent than in healthy controls. Vitamin D deficiency was not more frequently observed in patients with metabolic syndromes than in those without any metabolic syndrome. Overweight, obesity and metabolic syndrome risk are increased in individuals with vitamin D deficiency . According to the results of interventional studies examining the effect of vitamin D and calcium supplementation on diabetes prevention, there is no strong evidence that vitamin D supplements alone prevent type 2 diabetes in healthy people. However, studies have shown that vitamin D (400-1000 U/d) and calcium (600-1200 mg/d) supplementation may have a protective role for type 2 diabetes, especially in risk groups for type 2 diabetes and glucose intolerance . According to a study in which 320 healthy women aged 40-52 y were examined, the prevalence of vitamin D deficiency was found to be very high. Low vitamin D levels are associated with high body fat, high blood glucose, and decreased insulin sensitivity. Thus, vitamin D deficiency is a potential risk factor for the development of obesity and insulin resistance . A study was conducted with 31 female patients who had BMI values more than 25-35. According to results, there was a negative correlation between low vitamin D levels, insulin, and HOMA index levels . A study conducted with 1772 individuals (over 50 y old) showed that low serum concentrations of vitamin D were significantly associated with being overweight and obese . In our study, serum vitamin D level decreased statistically due to increased BMI. This suggests that obese individuals may be at risk for vitamin D deficiency. It is thought that this deficiency may be due to imbalance in feeding, insufficient movement due to obesity, and not enough taking advantage of the sunlight. There was a statistically significant increase in HbA1c levels due to increased BMI. This increase may be due to diabetic susceptibility in individuals with obesity-related increased insulin resistance. There is a positive correlation between BMI and insulin resistance. This suggests that insulin sensitivity is reduced in peripheral tissues depending on obesity. Positive correlation was found between HbA1C and insulin resistance. Because of increased insulin resistance the utility of glucose is decreased in tissues. Glucose level is increased. Consequently it is thought HbA1C levels are increased. There was no statistically significant difference between BMI groups in terms of the levels of insulin resistance. This may be due to the fact that the numbers of male and female individuals in the groups are not equal and the number of patients is low. It is thought that the relationship between the groups can be statistically more significant when the number of patients is increased. Our study was done retrospectively and we think that there are some limitations. Patient records did not reveal information about the amount of vitamin D taken on the diet, which could affect patient’s serum vitamin D levels, and how long they have benefited from sunlight. There was no information about the lifestyles and daily physical activities of the patients. Another important issue is whether vitamin D deficiency contributes to the development of obesity, or whether vitamin D levels have reduced due to obesity-related eating habits. For clarification of these issues, there is a need for more detailed studies in which more patients with more information are examined. In conclusion, vitamin D deficiency can be seen in obese individuals. Low serum vitamin D levels may accelerate the development of diabetes in obese individuals. When the patient’s benefit and the cost of treatment of these diseases are taken into consideration, serum vitamin D levels should be determined by routine controls, and necessary treatment should be done in obese individuals. This may delay obesity and the development of diabetes in individuals. It may be useful in the treatment of obesity. Sarnali TT, Moyenuddin PK. Obesity and disease association: A Review. AKMMC J 2010; 1: 21-24. Aygün N. Obezite Tanımı, Komplikasyonları, Endokrin Kontrolü ve Beslenme Tedavisi Obezite Tanımı, Komplikasyonları, Endokrin Kontrolü ve Beslenme Tedavisi. Okmeydanı Tıp Dergisi 30 (Ek sayı 1) 2014; 45-49. Soskić S, Stokić E, Isenović ER. The relationship between vitamin D and obesity. Curr Med Res Opinion 2014; 30. Dawson-Hughes B, Heaney RP, Holick MF, Lips P, Meunier PJ, Vieth R. Estimates of optimal vitamin D status. Osteoporos Int 2005; 16: 713-716. Durak MS, Akbiyik F, Demirpençe E. Obezite patogenezi. Hacettepe TIp Dergisi 2007; 38: 167-172. Wilborn C, Beckham J, Campbell B. Obesity: prevalence, theories, medical consequences, management, and research directions. J Int Soc Sports Nutr 2005; 2: 4-31. Kavadar G, Demircioğlu DT, Özgönenel L, Emre TY. The relationship between vitamin D status, physical activity and insulin resistance in overweight and obese subjects. Bosn J Basic Med Sci 2015; 15: 62-66. Chiu KC, Chu A, Go VL, Saad MF. Hypovitaminosis D is associated with insulin resistance and beta cell dysfunction. Am J Clin Nutr 2004; 79: 820-825. Altunoğlu EG. İnsülin Direnci İstanbul Tıp Derg. Istanbul Med J 2012; 13: 137-140. Ozkan B. Nutritional rickets. J Clin Res Pediatr Endocrinol 2010; 4: 137-143. Mathieu C, Badenhoop K. Vitamin D and type 1 diabetes mellitus: state of art. Trends Endocrinol Metab 2005; 16: 261-266. Norman AW, Frankel JB, Heldt AM, Grodsky GM. Vitamin D deficiency inhibits pancreatic secretion of insulin. Sci 1980; 209: 823-825. Cade C, Norman AW. Vitamin D3 improves impaired glucose tolerance and insulin secretion in the vitamin D-deficient rat in vivo. Endocrinol 1986; 119: 84-90. Boullion R, Carmeliet G, Verlinden L. Vitamin D and human health: lessons from vitamin D receptor null mice. Endocr Rev 2008; 29: 726-776. Cimbek A, Gürsoy G, Kirnap NG, Acar Y, Erol B, Özaşik I, Güngör F. Relation of serum 25 hydroxy vitamin D3 levels with insulin resistance in type 2 diabetic patients and normal subjects. Med Sci 2012; 1: 305. Alvarez JA, Ashraf A. Role of vitamin D in insulin secretion and insulin sensitivity for glucose homeostasis. Int J Endocrinol 2010; 2010: 351-385. Chiu KC, Chu A, Go VL, Saad MF. Hypovitaminosis D is associated with insulin resistance and cell dysfunction Am J Clin Nutr 2004; 79: 820-825. Kabadi SM, Lee BK, Liu L. Joint effects of obesity and vitamin D insufficiency on insulin resistance and type 2 diabetes. Diabet Care 2012; 35: 2048-2054. Naharcı Mİ, Bozoğlu E, Karadurmuş N, Türker T, Serdar MA, Hüseyin Doruk. Prediyabetli yaşlılarda vitamin D düzeylerine göre insülin duyarlılığının incelenmesi. Gülhane Tıp Derg 2011; 53: 271-276. Wortsman J, Matsuoka LY, Chen TC, Lu Z, Holick MF. Decreased bioavailability of vitamin D in obesity. Am J Clin Nutr 2000; 72: 690-693. Ou HY, Karnchanasorn R, Lee LZ, Chiu KC. Interaction of VKİ with vitamin D and insulin sensitivity. Eur J Clin Invest 2011; 41:1195-1201. Zhou QG, Hou FF, Guo ZJ, Liang M, Wang GB, Zhang X. 1, 25-Dihydroxyvitamin D improved the free fatty acid-induced insulin resistance in cultured C2C12 cells. Diabet Metab Res Rev 2008; 24: 459-464. Ford ES, Ajani UA, McGuire LC, Liu S. Concentrations of serum vitamin D and the metabolic syndrome among U.S adults. Diabet Care 2005; 28: 1228-1230. Forouhi NG, Luan J, Cooper A, Boucher BJ, Wareham NJ. Baseline serum 25-hydroxy vitamin D is predictive of future glycemic status and insulin resistance: the Medical Research Council Ely Prospective Study 1990-2000. Diabet 2008; 57: 2619-2625. Dutta D, Maisnam I, Shrivastava A, Sinha A. Serum vitamin-D predicts insulin resistance in individuals with pre-diabetes. Indian J Med Res 2013; 138: 853-860. Peterson CA, Tosh AK, Belenchia AM. Vitamin D insufficiency and insulin resistance in obese adolescents. Ther Adv Endocrinol Metab 2014; 5: 166-189. Karatas S, Hekimsoy Z, Dinc G, Onur E, Ozmen B. Vitamin D levels in overweight/obese adults with and without metabolic syndrome. J Endocrinol Metab 2013; 3: 47-56. Pittas AG, Lau J, Hu FB, Hughes BD. The role of vitamin D and calcium in type 2 diabetes: a systemic review and meta-analysis. J Clin Endocrinol Metab 2007; 92: 2017-2029. Grineva EN, Karonova T, Micheeva E, Belyaeva O, Nikitina IL. Vitamin D deficiency is a risk factor for obesity and diabetes type 2 in women at late reproductive age. Aging 2013; 5: 7. Caglar FNT, Isiksacan N, Kocamaz N, Akturk F. The Association among vitamin D, insulin resistance, and obesity in Turkish women. Shiraz E-Med J 2017; 18: e44925. Rontoyanni VG, Avila JC, Kaul S, Wong R, Veeranki SP. Association between obesity and serum 25(OH)D concentrations in older Mexican adults. Nutrients 2017; 9: 97.